It was quite embarrassing when I found out this was not the case...in my first year of university. Some days, I so wish this one turned out to be true. Alas, it seems to get more complicated, more heart breaking at times and, in some ways, messier. But at the same time, the older I get, the more I come to accept who God has made me, the more I strive for His plan and the more peace I find. One of these words was 'gimp'. Why I thought I invented words, I have no idea. This one makes me quite sad. I'm not very good at keeping in touch and as a result, many of my childhood and teenage friendships have grown apart. Even some of my college friends aren't as close as they once were. I don't really think I have to expand on this one. You can see for yourself. Pure '90's stud. I don't know how many times in the past couple years I have thought, "Oh geez, I sound like Dad." or someone(my dad) has told me, "You sound just like your mother!" If I had known when I was younger that this would be the case, I don't think I would have been very pleased. But I now recognize how lucky I am to have so many of my parents traits. **These next two are going to make it sound like I was kind of a lonely kid. I wasn't. I think I just had an over-active imagination at times. This was a belief I held early in my elementary school years of life. I would put my face under my pillow and a big billboard with my face on it would appear in their city so I could make announcements. That's also where I could type messages to them. I guess I was their leader? I think if you had asked me then if I thought the people were real, I would have firmly denied it. However, I think there was a very small part of me that hoped they were really there. Sometimes I would come into my room quickly and try to catch them interacting with each other. They were just so real to me. I loved them so much. Slowly, I came to the realization that they were, in fact, simply toys. And then 1995 came, and even though I was 12 years old, Toy Story rekindled my small belief and had me bursting into my room a few more times. Jenn, I can't wait to see what happens when Toy Story 3 comes out! 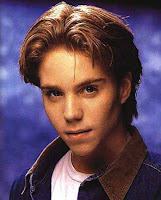 oh yeah and Jonathan Brandis...LOVED him in Ladybugs! !